Nicole Cennamo, the SA’s vice president for academic affairs, joined the race for SA president with a platform focused on improving accessibility for students with disabilities and designing more community space on campus. 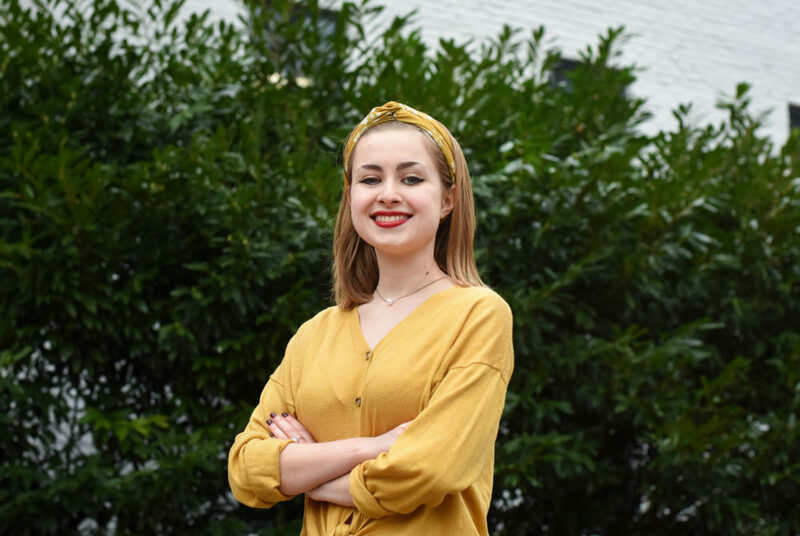 Updated: Feb. 28, 2019 at 12:19 a.m.
A sophomore with two years of Student Association experience announced her bid for the organization’s top post Thursday. Nicole Cennamo, the SA’s vice president for academic affairs, joined the race for SA president with a platform focused on improving accessibility for students with disabilities and designing more community space on campus. Her platform spells out 14 overarching goals with checklist items including creating a hangout spot for students in the Marvin Center and forming a task force to evaluate the physical accessibilities of some of GW’s buildings. “I want to make sure students are a top priority, I want to make sure the SA is accessible for students and that students always have a place on the fourth floor of Marvin to come for any of their issues,” she said. If elected, Cennamo said she wants to give students with disabilities a platform to voice concerns to officials and SA leaders. She said she will create a director of accessibility position on the SA who would act as a liaison between the Disabled Students Collective, Disability Support Services and the SA. Cennamo said she would also create a task force comprised of members of the Disabled Students Collective, SA leaders and officials from the Multicultural Student Services Center to evaluate whether the University complies with the American Disabilities Act of 1990. She said the University currently does not publicly share whether they meet accessibility standards, including website accessibility and content warnings, which are outlined by the ADA. In recent years, DSS registration has hit an all-time high. At the same time, students have raised concerns about the accessibility of some campus buildings and officials recently resolved a federal probe into the accessibility of GW’s websites. Cennamo said another main component of her platform is focused on fostering community. She said she would create a “living room” with couches, a TV and game tables on the Marvin Center fourth floor – similar to a hangout space at Tulane University – so students have a place to bond with one another. Cennamo said she discussed the idea Wednesday with Dean of the Student Experience Cissy Petty, who said she would be open to creating the space. Cennamo said she also wants every faculty member to undergo diversity training, which is not currently required. She said she will advocate for a program that would train a faculty member in every academic department on unconscious bias, and the faculty member would communicate what they learned to the rest of their department. Cennamo said she met with Jordan West, the inaugural diversity and inclusion education director, to discuss the training. “Faculty members don’t receive diversity and inclusion training, so ensuring that every professor has some degree of unconscious bias training is necessary to ensure that students do feel comfortable in the classroom setting,” she said. Cennamo added that she will advocate for student organizations to participate in a diversity and inclusion training in the form of an Excellence in Leadership Seminar. Student organizations are required to participate in at least five ELS sessions throughout the academic year. She said that if elected, she would also work with officials to design a compact outlining expectations for employees of the Office of Student Financial Assistance to communicate with students about the status of their financial aid forms. Cennamo said she will meet with Laurie Koehler, the senior vice provost for enrollment and the student experience, to discuss what the compact could include. Cennamo said students should not need to wait weeks to figure out whether they have correctly submitted financial aid documents, citing more than 60 students who allegedly could not immediately register for classes this semester because there were holds placed on their accounts. Officials announced an overhaul of the financial aid office last month to assign students an individual financial aid adviser and form an advisory council to discuss financial aid concerns. “As a student advocacy body, the SA needs to be more direct in supporting students and ensuring that the situation ceases to happen going forward,” she said. The Hatchet incorrectly reported that Cennamo’s platform included 12 platform points. After interviewing with The Hatchet, she revised her platform to highlight 14 points. We regret this error.